Throughout the summer, customers are focused mainly on the fresh produce available at the market. When we move indoors and the holiday season begins to creep up, the focus changes to holiday meals and unique handmade gifts. RFM has many talented artists, designers and makers offering a range of quality locally-made products. One of our newest artists, Grace of Forest Floor Arts, is returning to the market after a busy summer away. Grace is an illustrator working mainly in watercolour. 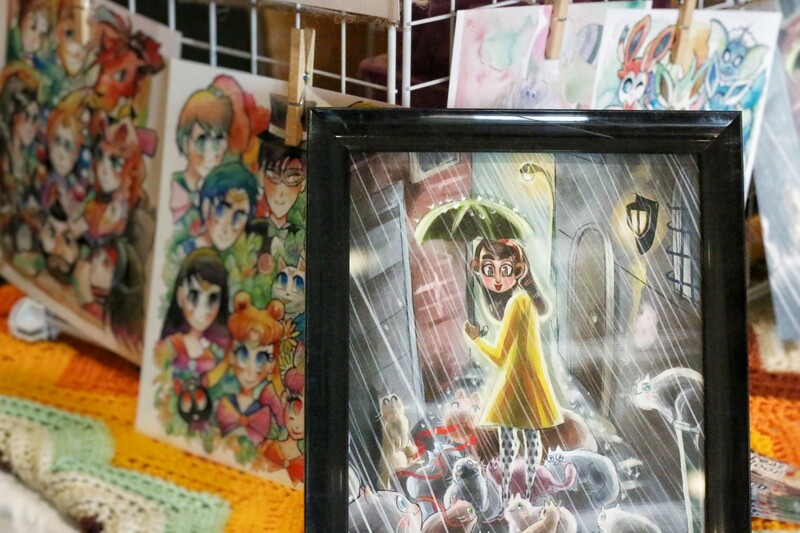 She'll have art prints, printed plush toys and jewelry available. Another one of our makers, Loretta's Distinctive Jewellery, is wrapping up her RFM season. Tomorrow's market will be the last one in 2016 for Loretta, and your last chance to admire her beautiful African-inspired jewelry. Loretta lives half of the year in Ethiopia and half in Canada. When she returns to Regina, she brings along handmade African beads and semi-precious stones to use in her jewelry designs. Stop by her table tomorrow and you may check a gift or two off your shopping list! Pile of Bones Beard Care Co. There will be vendors, RFM Kids' Club, Market Meals, and coffee/tea on the lower level during the market tomorrow. Don't forget to check out those vendors and grab a snack. If you'll be heading downstairs for RFM Kids' Club, the craft this week is cupcake liner poppies. BACK IN: Forest Floor Arts, Inspired by Beads, Lorraine's Kitchen, Metal Majesty, Prairie Engraving, and Rusty's Wild Rice. FRESH PRODUCE: Floating Gardens, Frontier Gardens, Heliotrope Organic Farm (outside), J9's Tiny Farm, Miller's By-Gone Farm, Rocky Acres Orchard, and Stellar Gourmet Mushrooms. Not all vendors are mentioned above; see the Vendor LIST for all in attendance. Refer to the Market MAP for vendor locations on the upper and lower levels (2 pages!). We're looking for volunteers to help out during our indoor season! Click HERE for more information.